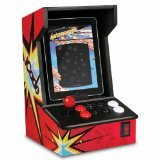 ION iCade Arcade Bluetooth Cab.. Product weight is 0.032 lbs. Update: I got one of the very first iCades when it was released and back then, the Atari app was the only compatible one. There are a lot more now. Also, since the third generation iPad isn't shaped all that differently from the iPad 2, it's most likely compatible.First I should mention that the iCade cabinet design may look like the picture on this page, or one with a more rainbow look to it. Don't worry though, it looks great. Very 80s.The hardw..